This image is being share in the social media. 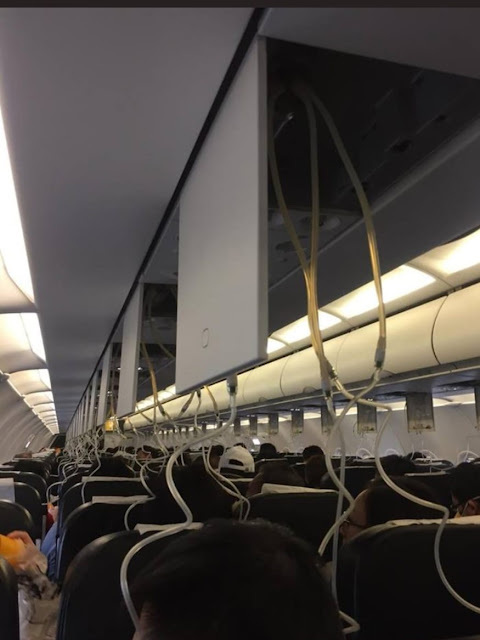 The oxygen masks in the cabin was deployed when the plane was about 30 minutes before landing at Taipei Taoyuan Airport on 24 March (yesterday). The flight was TR996. It was described as a "terrifying" experience by one passenger. There were 180 passengers on the flight. Fortunately, the plane landed safely and no one was hurt. Usually when the cabin pressurisation is lost and the cabin altitude is above 14,000 ft, the masks will automatically dropped from the compartments above the passengers. Other times, the masks may be deployed or dropped when the landing is rough or due to severe turbulence. As for TR996, no explanation was given. When FO Ceca on board,expect the expected. !